Held up from playing while drummer Phil Mélanson tended to an issue with a midi cable, Bernice singer Robin Dann treated the crowd to her casually awkward brand of stage banter. 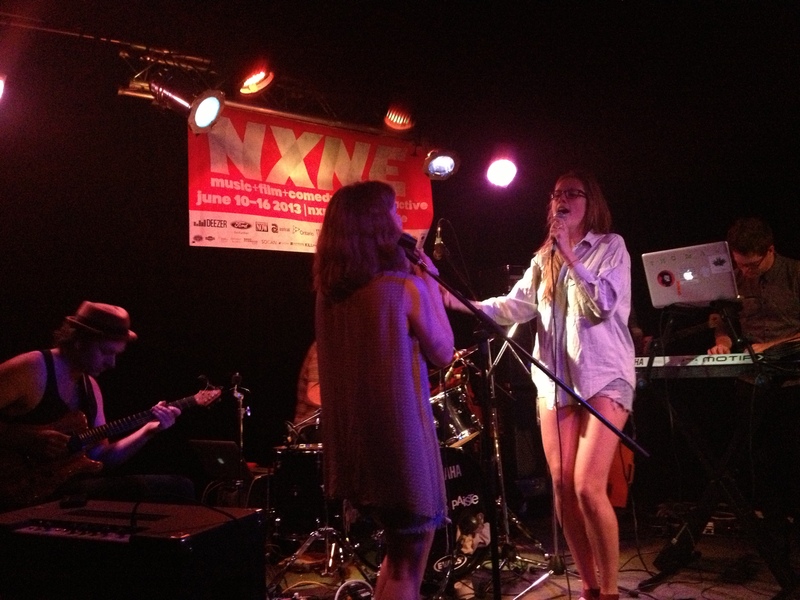 And although the music portion of NXNE had only just begun a couple of hours earlier, she was right; there were already plenty of bands playing sets across the city. But those that stuck around were compensated for their patience. Although they filled out the The Piston’s tiny backroom stage just in their numbers and instruments – and the space was further crowded by the fact that guitarist Colin Fisher (notthewindnottheflag, Caribou) was confined to a seated performance (he’d hobbled into the venue on crutches, but still demonstrated his shoegaze savvy as he systematically switched through his fairly extensive pedal board) – as they felt out the space the band even added a sizeable amp to the stage mid-set. While the combined lack of organization and clumsy candor might just sound like a recipe for disaster, it sort of just fit the output of Bernice’s soothingly emotive RnB-infused indie rock. At least it literally had the crowd singing, “Ooh and I need it” along with the band at the end of their set. This entry was posted in Burden of Salt and tagged Bernice, Caribou, Colin Fisher, Not the Flag, Not the Wind, NXNE, Phil Mélanson, Robin Dann on June 13, 2013 by Tom Beedham.